There are a few plants that every prairie garden should include – peonies, clematis, lilacs, roses – and lilies. 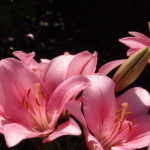 Lilies are one of the true garden stars offering tremendous value with little effort. 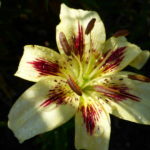 Lilies are hardy in our climate (with a few exceptions) and easy to grow. They take up a small amount of real-estate in the garden, but provide fabulous colour and create a strong impact. Lilies offer incredible diversity of flowers with variation in bloom size, shape, arrangement, number and colour. Gardeners can choose from a wide range of bloom times and plant heights. 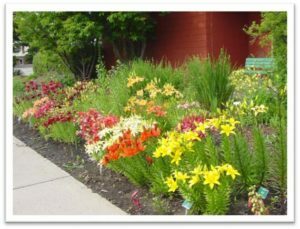 The versatility and variety that lilies bring to the garden, means there is a lily for virtually any situation. And with a bit of basic knowledge, anyone can be successful growing them. forgiven for thinking that these were the same as or similar to true lilies (which are the focus of this series of articles). But in fact, although they share some common features, they are all very different plants. This is a great example of the confusion that can arise when relying on common plant names rather than delving into what can often seem the confusing world of scientific (Latin) plant names. Common plant names can vary from country to country, even from one region to another. Different cultures may use different common names for the same plant. This can make it difficult to be confidant that two people are talking about the same plant.To make matters more confusing, one plant may have several common names. For example, the Alberta native plant Geum triflorum has several common names: old man’s whiskers, prairie smoke, three-flowered avens, and purple avens. If you search on the internet for old man’s whiskers, you may find information on Tillandsia usneoides, also known by the common name of Spanish moss. 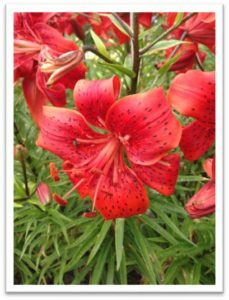 For our purposes when we use the term ‘lily’ we are shining the spotlight on true lilies which are found in the genus Lilium in the Lily Family (Liliaceae). Other genera in this family include Tulipa (tulips), Erythronium (fawnlily), and Fritillaria(mission bells, fritillary) to name just a few. By contrast, lily of the valley is in the Convallaria genus in the Asparagus Family (Asparagaceae) and day lilies are in the Hemerocallis genus in the Aloe Family (Xanthorrhoeaceae ). 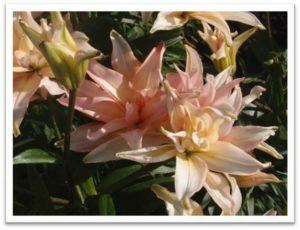 Lilies are considered herbaceous perennial plants because their life cycle continues for more than one year, and all their above-ground growth dies back at the end of each season and re-emerges each spring. Flowering plants are divided into two main categories – Monocots and Dicots. Lilies are Monocots, characterized by parallel leaf veins, flower parts (petals, sepals, pistils etc.) in groups of 3’s, fibrous root systems, and a single seed leaf emerging after germination. Other familiar Monocots are grasses, onions, tulips and many others. Dicots by contrast have flowers parts in groups of 4’s and 5’s, taproot systems, netted leaf veins and two seed leaves. Dicots include many familiar garden plants such as geraniums, delphiniums, as well as trees and shrubs. 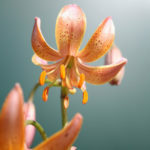 Stay tuned for the next installment to learn more about the anatomy of a lily.